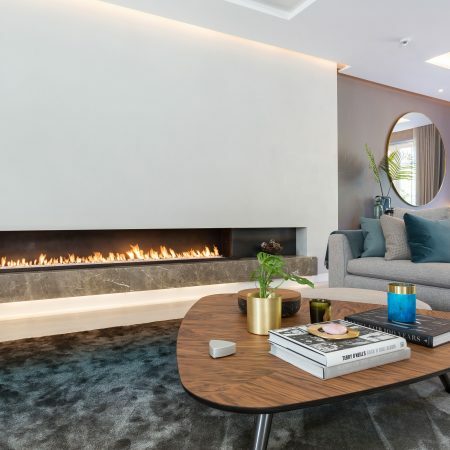 This bespoke bioethanol fire has been integrated as the main feature in this beautiful contemporary living space and set into a concrete base. Bioethanol fires are fantastic ways of integrating a wonderful feature fireplace without the requirement of a flue/chimney or gas supply as they are essentially designed to be flueless. It makes them ideal for flats and apartments or simply situations where installing a flue/chimney is not possible. 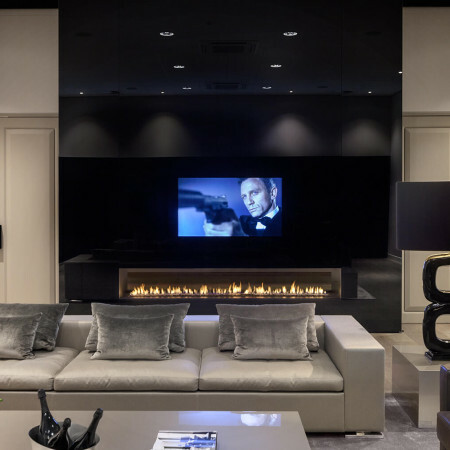 Our bioethanol fires are fully electronic for flame ignition and flame height variation, they have several built in safety features built in and the advanced technology enables them to controlled via Smartphones as well as the option for Smarthome integration. With a large range of high specification bioethanol fires available of varying sizes and specifications, as well as the ability to create completely bespoke sizes, we are able to design bioethanol fires unique to individual spaces.